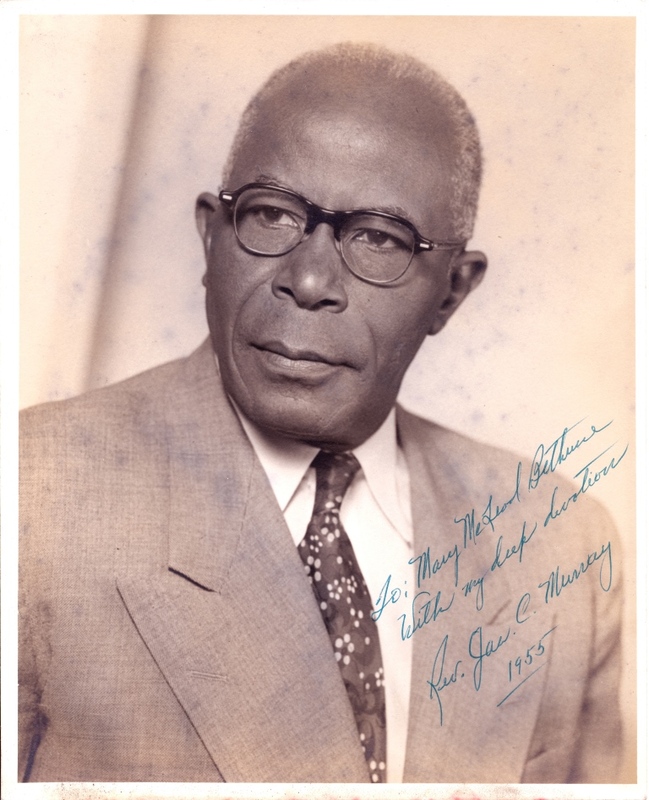 An autographed portrait of James C. Murray, which is housed at the Mary McLeod Bethune Foundation, located at 640 Dr. Mary McLeod Bethune Boulevard in Daytona Beach, Florida. Murray was the pastor of Stewart Memorial Methodist Church, located just down the road from the museum at 554 Dr. Mary McLeod Bethune Boulevard. Originally called Stewart Memorial Episcopal Church, the church was founded in 1893 by Reverend Thomas H. B. Walker. The location of the congregation's first meetings is unknown, but a chapel was constructed at Second Avenue (present-day Dr. Mary McLeod Bethune Boulevard) and Spruce Street. Funds for its construction were donated by retired minister Reverend M. L. Stewart, for whom the church was named. The chapel was demolished in the 1920s and a new, two-story building was completed in 1926, after being delayed by a devastating storm in 1926. The church was renamed Stewart Memorial Methodist Church in 1939, when the congregation reunited with the Methodist Church and was placed in the Central Jurisdiction of the Methodist Church, which was for African-American congregations only. 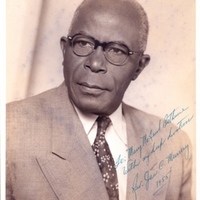 On May 23, 1955, Murray attended Dr. Bethune's funeral. In 1967, the church changed its name to Stewart Memorial United Methodist Church. The congregation moved to a new building in 1973. The remaining structure was purchased by the City of Daytona Beach and converted into the Richard V. Moore Community Center, named after Dr. Moore, president of Bethune-Cookman College from 1947 to 1974. Original 8 x 10 inch black and white photographic print: Sun room, image 133, Mary McLeod Bethune Foundation, Daytona Beach, Florida. Miller, Jake C., Ph. D. The Rich Heritage of Stewart Memorial United Methodist Church. Palm Coast, FL. : Backintyme, 2011. "Stewart Memorial Methodist Church." City of Daytona Beach. http://www.codb.us/index.aspx?NID=524. "ABOUT." Stewart Memorial United Methodist Church. hhttp://www.ourchurch.com/member/s/stewartmemumc/index.php?p=1_2_About. "Scenes From The Funeral Of Mrs. Mary M. Bethune Where Over 5,000 People Were Attendance." Memphis World, Vol. 23, No. 95, May 27, 1955. http://www.crossroadstofreedom.org/view.player?pid=rds:72853. “James C. Murray.” RICHES of Central Florida accessed April 23, 2019, https://richesmi.cah.ucf.edu/omeka/items/show/5177.